For the past few days, the Inhabitat team has been scouring the Milan Design Fair, searching for the freshest new green designs. From the satellite shows to Milan's biggest and best design museum, we recently checked out the Triennale di Milano. Currently on show in this incredible space is the fantastic 'Design in Nature' exhibition, a series focused on sustainable materials. Whether you're seeking a sensory delight or simply searching to view some inspired uses of eco-resin and bamboo strips, this superb museum is brimming with endless design installations arriving from brilliant design minds all over the world, just in time for the Salone del Mobile. 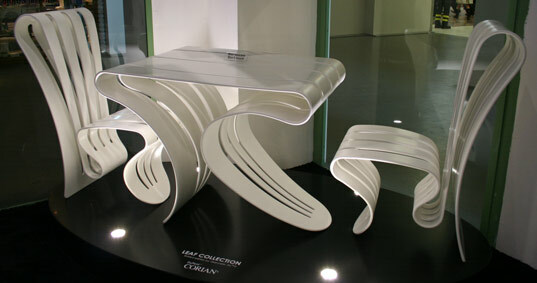 The Leaf Collection by Giancarlo Zema is one of the main features of the Design in Nature Exhibition. The dynamic forms have a flexible memory back that adapt to the curves of the body. The designs have been formed with Dupont Corian 'eco concrete'. Wooden stools from Giancarlo Zema's Bright Woods collection are made from wood and resin rings that create a wonderful interactive experience as they change colour and glow. The stools come in a variety of colors and heights, making them a perfect compliment to any room. 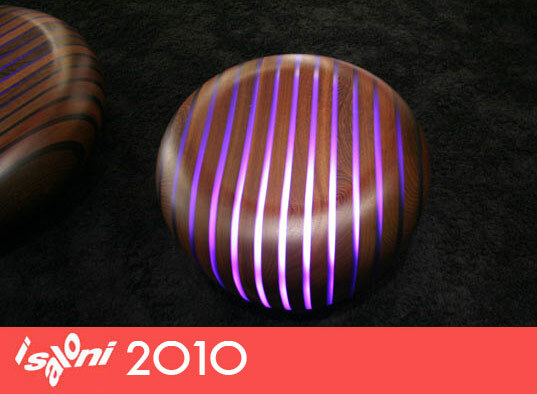 Bright Wood's illuminated stools have a polished finish, creating a chic and unique design. The green material library provided by Material Connexion add a nice technical element to the exhibition, presenting a number of inspiring and green materials. One of the larger material installations on display is the Eco Resin. A colourful range gives them the aesthetic flexibility needed to be applied to number of products. The Cocoon Plan was created in a collaboration between designer Rock Wang and craftsman Kao-min Chen. These seating units were created with woven bamboo strips. They also benefit from the help of silk worms that were used to create the white covering. The Cocoon Stool is a splendid example of the benefits of fusing renewable materials with modern design techniques. The installation Timeless Future showed the work of Toshiyuki Kita and included beautiful natural designs for 2010. The pieces included the Bamboo Table and the HOTEI Chair - a chair created using materials from the water hyacinth aquatic plant.